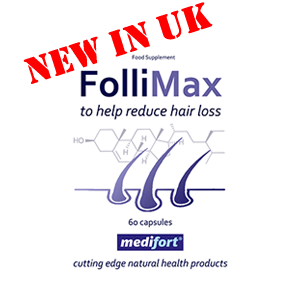 FolliMax is a new formula offering a natural DHT inhibitor for the treatment of hair loss. Now available in the UK from Medifort. FolliMax is a new formula for the treatment of hair loss and thinning now available in the UK from Medifort. FolliMax utilises refined beta sitosterol combined with other plant sterols shown to have an enhanced synergistic effect. Beta sitosterol is a phytosterol that comes from plants. It is shown to prevent hair loss by reducing the production of the androgen DHT. It does this by inhibiting the 5-alpha reductase type II enzyme. This enzyme is responsible for the conversion of testosterone to DHT, known to play a significant part in hair loss. Those who experience the best results are in the early stages of hair loss. Mild to moderate cases will usually see the most success. L’Oréal launched a product called “Hair Mass” a few years ago. The primary ingredient of this hair loss product was beta sitosterol. Results of their testing showed “significantly positive results”. This is not available any longer. It is not possible for pharmaceutical companies to hold the exclusive rights to beta sitosterol. There are 60 capsules of FolliMax in one bottle. We recommend two capsules of FolliMax daily, one in the morning and one in the evening with meals. Please note that beta sitosterol is not recommended for women who are pregnant or breast feeding or anyone who has had an organ or bone marrow transplant. If you are taking any blood thinning agents you should have your INR levels checked as beta sitosterol can affect this. The added benefit of taking FolliMax is that beta sitosterol has been shown to help reduce cholesterol (it is added to some margarines), can shrink an enlarged prostate gland in men and boost the immune system. In the USA, the Food and Drug Administration (FDA) has allowed manufacturers of beta sitosterol to include that it reduces the risk of coronary heart disease on the labels of their products. Only been using for a month but definitely less hair coming out when I wash it. Will keep using and see how it goes. i’ve done a lot of research into this as i’m still young (31) and already thinning. there are a lot of similar products like this but the beta sitosterol content is not as high as this. so far so good so I’ll keep taking it. I have to admit I was sceptical but after 2 months taking this I am pretty sure that my hair loss seems to have slowed down a lot. I’ll continue and see what happens. It seems to work. Less hair in my brush and it’s looking thicker. I’ve been thinning for a few years and am very sensitive to any improvements. i’ve read up a lot on the various natural remedies for treating hair loss and beta sitosterol does seem to have credibility so i’ll keep trying. i’m now on my 2nd month and it is helping but not as fast as i’d like.